After leaving Texas few weeks ago I traveled up to New Jersey for a few weeks of “Carnage Seminars” and personal training sessions. Discovering the East Coast vibes from New York, Jersey and Philadelphia. The seminars on the East Coast have been great with a lot of Muay Thai interest, and in general Martial Arts lovers. I always find nice to meet people that follow that path. Well, two hours later, as I have no clue of directions in America yet, we ended up in the ski mountains of Pennsylvania, which was two hours away from where I needed to be at 12 pm. It was 12.05 pm. So you can imagine the panic and of course language! Calling the gym to hope that the students would all wait for me, and in their respect they did. It was another two hours of driving in the rain of course, but four hours later, we finally got there for the seminar, and still did a full three hours. I have to admit, I was pretty tired and hungry by the end of it all. 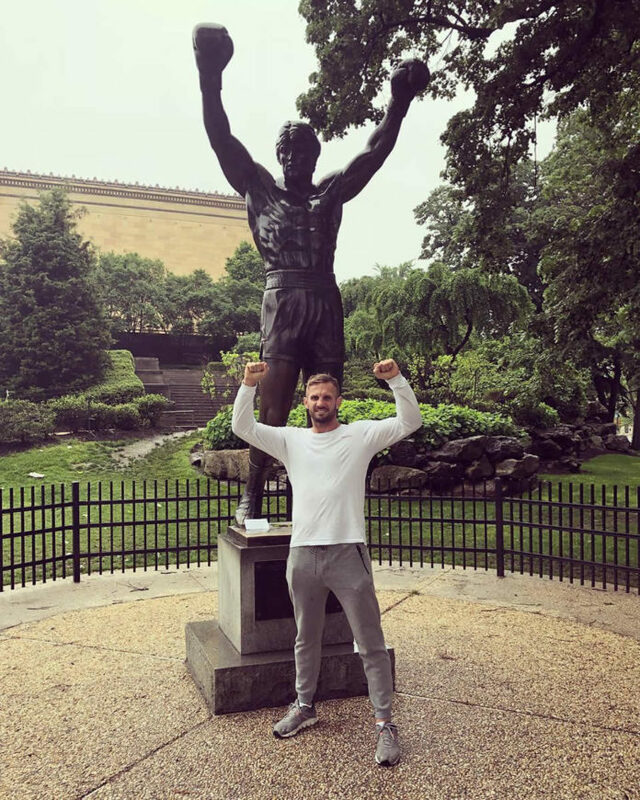 But it was such an effort to get to Philadelphia, so I couldn’t not visit the legend Rocky Balboa for a quick picture. Raining or not, we shot over there and got the picture. I remembered the movie with the stairs, and was happy I got to go there, before having dinner, and then another two hours driving back home. A long day for sure, but in the end, it was an inspiring journey! Few days to relax before heading to North Carolina for another week of teaching at my good friends gym ‘Eight points Muay Thai’. Thank you East Coast for the memories and fun times. I will definitely see you all again later this year.